Or to put it more simply, the bill would have annexed Canada, before Canada became a country. If the bill had passed, it would have added 4 new states and 3 new territories to the United States. The Annexation Bill of 1866 of course excluded Alaska, which at the time was still owned by the Russian Empire. Yet, Alaska would actually go on to join the United States the following year when it was purchased from Russia for $7.2 million. The Annexation Bill of 1866 was introduced by Massachusetts Congressman Nathaniel Prentice Banks and was intended to appeal to Irish Americans who supported the Fenian Movement, which was extremely hostile to Britain. However, while the the bill was sent to committee, it never came back and was never passed in the United States House of Representatives or even presented to the United States Senate. US population in 1865: approximately 35 million. The US obviously defeated the UK in the Revolutionary War at the end of the 18th century. However, it was unable to invade Canada during the War of 1812, which resulted in a draw (with both side declaring victory). By the end of the Civil War the Union Army alone was several times the size of the British Army and located right next door to Canada, whereas the British were an ocean away and had to use deploy their army throughout their Empire. In terms of population the two sides are remarkably evenly matched with British North America plus Great Britain and Ireland almost exactly matching the population of the United States. The economy of the United States was in poor shape following the Civil War, with huge debts and the economies of the Southern States in ruins. Great Britain, on the other hand, was the pre-eminent industrial power in the world at the time with the world’s most powerful navy. Furthermore, the US would send 20,000 troops to the Southern States in 1867 to enforce the Reconstruction Acts. 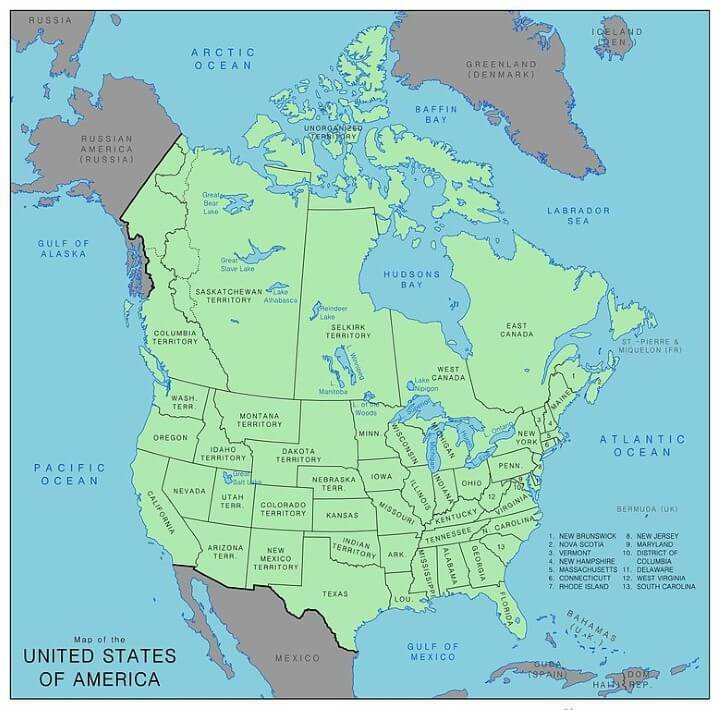 Therefore, given it’s military strength and location, it seems likely that the United States could have successfully invaded Canada. However, given its economic situation and desire to reconstruct the South, it’s a big question of whether or not they would have been able to hold it if Canadians and/or British had decided to resist. Fortunately, politicians of the time, did not take The Annexation Bill of 1866 seriously and Canada remains an independent country and the UK and US enjoy their special relationship. One forgets that that Britain was not just Great Britain and Ireland, but included it’s entire empire, from which it could levy troops. From which overseas territories do you envision the UK levying? Australia with their population of 1.4 million? India? South Africa? I think Britain would have felt more of a manpower drain than a manpower source from their colonies. They were economically important so British troops that otherwise could have been sent to North America would have had to remain in their overseas territories. But I can’t imagine the US public would have felt much like another war immediately after the Civil War. Plus there was a lot more important work to be done with the Reconstruction. Those are probably the reasons it never even made it out of committee. India alone from my recollections was an abundant pool for colonial troops. You seem to be over-emphasising possessions being colonised by Europeans themselves rather than the other possessions. The key to understanding the British Empire’s manpower advantage is the word EMPIRE. wasn’t worth it to the British to keep fighting. What do you think the attitude of the populace of India, for example, would have been if the British sent tens of thousands of Indians off to the other side of the world to fight? Especially after over half of them never came back. What do you think the morale of those troops would have been in the cold Canadian climate eating food very foreign to them? Troops are also not replaceable parts. You can’t expect troops from India to perform that well in Canada against a seasoned army like the Americans had. If you were the UK would you risk losing India to hold onto Canada? If you were an Indian would you want to risk losing your life to help Britain hold onto Canada? Your map is incorrect in that you have Newfoundland as part of East Canada, it was never part of the original four, The Labrador part of the province , except for its coast, may have considered part of East Canada because that wasn’t decided until 1927 by international tribunal. But the island part and the coastal of Labrador would have been excluded. Newfoundland did not join Canada until 1949, close to a century later. Labrador was given to Newfoundland in 1809, though the border was never fully specified back then. Québec only disputed the exact border between it and Labrador, never the severing of it. Someone should set up the scenario in Civilization and see how it plays out! Would have completely changed beer history as we know it. Sounds about as ill-informed about Canadian opinion as the thought during the War of 1812 that Canadians would immediately revolt the moment American troops waltzed across the border. Time to get this bill passed…..
Hells no. No sane Canadian wants our country to be part of the USA. Small point of contention: The war of 1812 was started by America, with advances into Canada as part of their war goals. Not only did America fail to achieve any gains, the Americans had their capital occupied (if briefly) and burned down by a British army. British naval superiority meant the US was effectively unable to project power further and thus by strategic superiority of their opponents position, had their options for continuance of the conflict restricted. The only rational conclusion is that the United States lost. It’s telling also how badly the US lost that it’s best popular revisionism is to call it a draw, as opposed to other wars. Most well known being WW2 European theatre, where many Americans still believe the US won and defeated Nazi Germany. Which is false in that the Soviet Union was already in the process of defeating Nazi Germany by the time of the Western Front being opened, and would have gone onto defeating Germany regardless. The Western allies land-war on that front was thus at best tying up some forces in the west and only modestly hastening the end of the war in Europe. Britain at the time was the world’s pre-eminent super-power, and America still in many ways a ex-colonial backwater. It’s a credit to America that it had managed to survive and then thrive, but I feel like the strength of it’s hand in these earlier conflicts is overplayed. We must always remember that the Revolutionary War was ultimately just a peripheral theatre of wider European imperial conflict, Manifest Destiny and US exceptionalism is self-deluding, not overly disimilar to North Korean notions of being able to single-handedly defeat the US in a full-on war. You’re obviously anti-American. You are basing extreme claims on disputed interpretations carefully chosen to be amenable to your bias. You also seem to set up a strawman when you say “the strength of its hand in these earlier conflicts is overstated”, because in general people do not consider that the U.S. had a strong hand in the American War of Independence or in the War of 1812. It was and is well-known that Britain at that time was the most powerful country in the world. Since the US beat the UK in the Revolutionary War, succeeded in spanning the continent, and became the most powerful country in the world is it your opinion that North Korea can single-handedly defeat the US in a full-on war? Wierd that you consider historical accuracy as “anti-American”. Please work on your nationalism, nobody can take your statements on objective facts seriously when you’re clearly biased. Why did you bother replying? All you did was try to accuse me of doing what you are doing. Furthermore, the only objective facts here are that your interpretations are currently contended among historians. Even the historians that support any of your various carefully chosen interpretations would never call them “objective facts.” An objective fact is something like “The US declared war on the UK on June 18, 1812.” For a historian to propose a narrative for what led to that declaration of war is an interpretation of the known facts, not an objective fact. You are all look-alikes anyway.